Norway, the country and team represented by the World Champion, Magnus Carlsen, finished strong at fifth place in the last Olympiad. 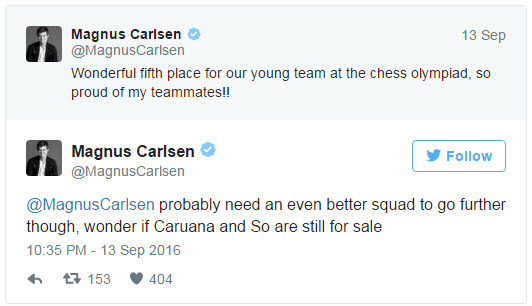 World Champion Magnus Carlsen tweets on Tuesday, September 13, 2016. Chess players switching federations is not something new in the chess world. They have happened a lot of times in the past (See: List of nationality transfers in chess), especially among the former USSR countries. But they have not become too controversial until today when the team involved, the United States that benefited in the players’ transfers, won the Olympiad. Nevertheless, I wonder which is more insulting from the insinuations of Magnus Carlsen: the paid up team or the paid up players? Young man that is the feeling of being on top and having no medal. 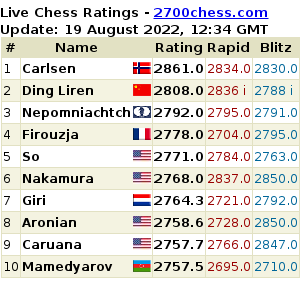 Look at russian team they are higher in terms of ELO rating and yet say nothing because they are mature. Globalization.has taken hold of chess. Even amateurism,nationalism has been reformatted. Its not as if players are being corrupted. Why for instance Russian players like Korchnoi migrated,and became part of the Swiss was political. Maybe its the system,or the way the world has changed. So had an axe to grind against PCF,and not even Torrees defense could prevent a switch to the other side.of the board. If the Norwegians would like to float and prove their nationalism is the right value,they should prove it over the board and not make the issue political. whatever issue in chess is?the result will decive if the rules are better or not…or is the rules benefiting the players or not.I think players compensation must rule first before any other pride.